Paying your loan off faster. A borrower borrows $500,000 at an interest rate of 5.5% per annum for 25 years. The ‘principal’ is the amount you borrowed. The ‘interest’ is the amount you are charged for borrowing the money. The ‘loan term’ is how long the loan contract is for. On almost all home mortgages, interest is calculated daily, but added to the loan balance at the end of the month. 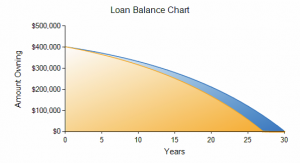 Loan repayments are either ‘interest only’ (IO), or ‘principal and interest’ (P&I). Most home mortgages in Australia are by default ‘principal and interest’. P&I loans mean that the repayment is calculated to repay the loan in full by the end of the loan term. The P&I repayment is made up of two portions, one being the ‘interest’ charged for the month, and the other portion being an amount which pays back the ‘principal’. By the end of the ‘loan term’, the principal is paid off completely. If you choose ‘interest only’ repayments, your repayment will match exactly the interest you have been charged, and there is no amount being repaid on the ‘principal’ That means that unless you sell the house or switch to a P&I loan, you’ll never get rid of the mortgage and you’ll be paying interest forever. You should always choose to repay by ‘principal and interest’ rather than ‘interest only’, unless your accountant advises otherwise. They key in repaying your loan faster is to reduce the ‘principal’ as fast as you can by making ‘extra payments’. These are payments above the set minimum repayments. Every extra dollar you put into your loan should save you around $2 over the term or the loan. If you struggle to make regular ‘extra payments’, even a one-off lump sum deposit, such as a tax refund, can have a positive effect. A lump sum payment of, say, $1500 in the third year of a $200,000 home loan at 7.5% could cut your loan by five months and save you more than $6,000 in interest. Another simple strategy is to pay say $100 extra per month. It is a simple strategy that can save you thousands. On a $400,000 loan over 30 years at an average interest rate of 5.5% pa you will reduce interest payments by almost $48,326, they will cut the term by 2 years and 11 months!! Are You Eligible for a First Home Buyer Grant? As a mortgage broker, First Stop Lending has a relationship with most Australian bank and non bank lenders. This allows us to search for the best loan available on the market to suit your individual needs. This provides a great benefit over banks, which are limited to their own range of loans.